Samsung Galaxy Note 5 was recently voted as the best smartphone in the United States. The phone went above the likes of Apple iPhone 6S Plus and its counterpart Samsung Galaxy S6 in becoming one of the most used devices in the country. Of course, this is true because the phone is a flagship that packs some of the best specifications you can find on a phone. The metal and glass design is just amazing and so is the S Pen stylus that has made the Galaxy Note series a unique offering from Samsung. The Note 5 is extremely fast and sleek in performance thanks to the 8-core Exynos 7420 SoC that is paired with a decent RAM of 4GB. You also get a 5.7-inch Super AMOLED display with QHD resolution that delivers one of the best, if not the best, display qualities you can get on a smartphone screen. Despite all these goodies that the Note 5 packs, Verizon users will still be disappointed in the fact that Samsung Galaxy Note 5 doesn’t come with everything that the unlocked variant comes with. Of course, there is always the option of buying an unlocked variant, but not so many people can afford this option, hence the need for carrier-based devices. One feature that Verizon users of Samsung Galaxy Note 5 are missing is Write On PDF. Why the carrier decided to omit this feature from its variant is still unknown, but Samsung is aware of the importance of this feature. The company has come to the rescue of Verizon users by creating a Write On PDF app that is now available via the official Google Play Store. As mentioned, it is easy to find some features that are available on factory unlocked versions but at the same time, they are missing on carrier-based versions. 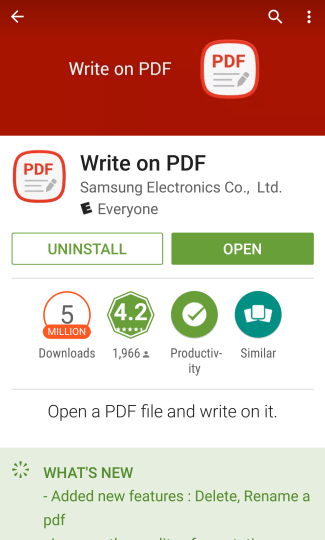 With this knowledge, Samsung decided to equip the Play Store with a standalone Write On PDF app. Once you’ve downloaded and installed the app on your Samsung Galaxy Note 5, the feature will allow you to select and open any PDF file and when this is done, writing on the same files will also be enabled. When done with writing, you can even save the notes.